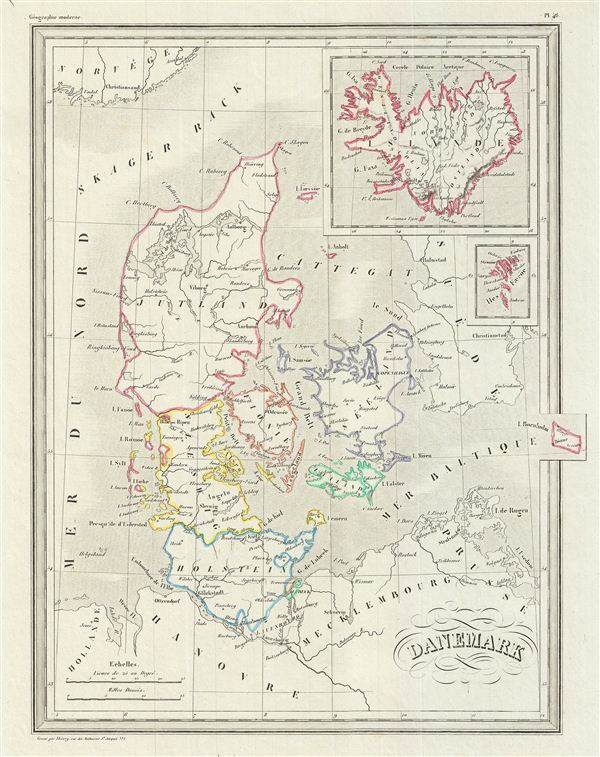 This is a fine example of Conrad Malte-Brun's 1843 map of Denmark. It covers all of Denmark inclusive of the Duchy of Holstein and as far east as the island of Bornholm. The Kattegat (Cattegat) is also identified. Two insets in the upper right quadrant depict Iceland and the Faroe Islands. As this map was being printed, Scandinavia was in the midst of a prolonged period of peace and prosperity that led to a cultural and population boom. Various cities, towns, rivers, islands and other topographical details are marked, with relief shown by hachure. Boundaries are color coded according to regions and territories. This map was issued as plate no. 46 in Conrad Malte-Brun's 1843 Precis de la Geographie Universelle.